Herb Robert is a disagreeable-smelling annual or perennial plant, 6-18 inches high; the reddish stem is glandular-hairy, thick, juicy, and forked. The opposite, palmate, 3-5 toothed segment, leaves with pinnate or pinnatifid leaflets are deep green, often tinged with red. The purplish-red or rose colored flowers grow in pairs from May to October. The 5 petals are not notched but have long claws which suggest the long bill of a stork or crane. Found in rocky woods, roadsides, ditches, waste places from Nova Scotia south to Pennsylvania and west to Manitoba and Missouri; also common in Europe, Asia, and North Africa. Some say, as does the Webster’s Dictionary, that this plant was named after Robert, Duke of Normandy or possibly after St. Robert, founder of the Carthusians. 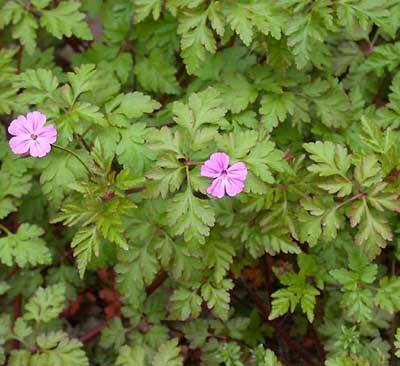 Farmers for centuries have used Herb Robert for treating cattle. Internal use is recommended for diarrhea, gastritis, enteritis, gout, and external hemorrhage. A hot poultice of boiled leaves is said to be good for bladder pains, fistulas, bruises, erysipelas, malaria, tuberculosis, stomach ailments, intestinal ailments, jaundice, gargle for sore throat, kidney infections, tumors, ulcers, and persistent skin problems. The green, crushed leaves are applied to relieve pain and inflammation. Use the tea also as a rinse for inflammations of the mouth, and the dilute tea as an eyewash. Externally, wash or poultice used to relieve swollen breasts, wounds, and is a folk remedy for cancer. Remove any developing fruit before using. Infusion: steep 1 level tbsp. dried herb in 1 cup water for a short time. Take 1 cup per day. Cold extract: use 2 tsp. dried herb with 1 cup cold water. Let stand for 8-10 hours in a covered pot.